I don’t have the answer. I just want to ask it and I definitely want to hear from you. What is soundcloud? Does it fit in with what a DIY/indie musician or band needs? If so, how does it fit? Will that change as SoundCloud continues to monetize? 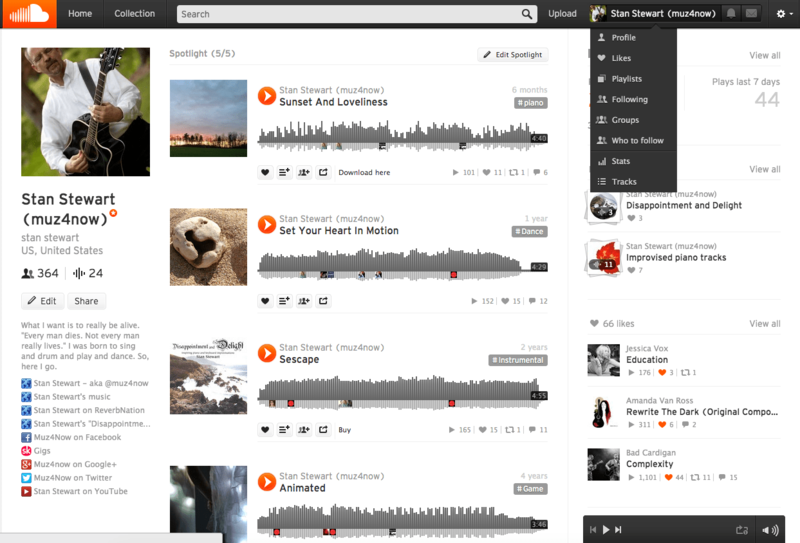 Is SoundCloud a good place for indie music? Straight from the source: “SoundCloud is the world’s leading social sound platform where anyone can create sounds and share them everywhere.” So, it’s the “world’s leading social sound platform”. Social is good. Leading is good. Though these can mean a myriad of things. As we’ve seen with social networks like Twitter vs. Instagram vs. Google+. Each has a very different character, different struggle behind the scenes and very different ways of dealing with creators. SoundCloud has a reputation for being a very open platform. Certainly, they’ve had to deal with issues of copyright and intellectual property. Their decision to monetize has increased the fray around some of these questions for obvious reasons. But let’s look at the second half of that sentence: “where anyone can create sounds and share them everywhere.” I think it’s safe to say that SoundCloud has benefitted from the “democratization of sound production.” All you have to do is randomly play a few dozen tracks on their platform to see how varied the quality of sound production and musicality is. As you know if you read this blog, my interest is in so-called independent or DIY or Do-It-Together musicians. In other words, musicians who are not on a major label. My question then becomes: Is SoundCloud a good platform for indie musicians? My own personal jury is out. Certainly, they provide a place to have music heard, shared, commented, liked, and so on. Their free version is quite useful and the “Pro” paid version is not too expensive. There is easy integration with blog and social media sites. In other words, if you are looking for a place to share and get likes, this may be your spot. Recently, this whole “post stuff to get likes” thing has me puzzled. I know that it’s been pulling at me for years, but now, it seems so hollow. I’d much rather have people read my blog posts, engage in dialogue, and help each other in ways that meet needs beyond personal ego. In other words, the “get likes” thing hits close enough to home that I can understand it, but I no longer crave it. I’m looking for sharing that goes deeper. Do you want LIKES or real support? If you do post your original music on SoundCloud, be sure to enter your “Permissions” with care. Obviously, don’t leave “Enable Download” checked unless that’s what you want. The second row of comments and like features being public (or not) is self-explanatory. Only check the “Display Embed Code” if you want other people to be able to easily copy the information that would allow them to post your track on their web site without checking with you. The “Enable App Playback” must be checked to allow mobile devices to play your sounds. Unfortunately, it also means that anyone can embed your track anywhere they like on the web. Consider the trade-offs and decide. I enable it because of the mobile feature. So, as you can see, I still have music on SoundCloud. For me, the question is whether I should leave it there and continue to post music. Or is it time to put even more focus on sites like BandCamp and CDBaby? What do you think? Please leave your comments and continue the dialogue! Stan, you raise some good points – it caught my attention as my son is also a musician. My question though, is why not pursue BOTH (SoundCloud and BandCamp / CDBaby)? Does it have to be an either/or? Seems like SoundCloud could be a place for enticing snippets that would drive people to other (paying) sites, or is that redundant since CDBaby etc give the opportunity to listen to samples? Good thoughts, Peggy! Of course, you can always do multiple sites if you have the time and are getting a pay-off. I have “buy” and “download” links to the other sites from SoundCloud, but according to what I can see they have never resulted in a sale. I’d be very interested to know if others have a different experience. Clearly, BandCamp and CDBaby are not trying to be “social” sites while Soundcloud states that it is one. That’s an interesting premise since in many ways it does not appear to be in direct competition with Twitter, FaceBook, etc. And as I said, I’m still there. Just wondering if it’s wise to spend my time there. As you probably know, I’m doing lots more with local performance than recordings right now, so how I spend the limited time I’m giving to digital music is really about choices for me. @muz4now it's a fantastic place for indie! As a ‘creative’ there’s just so many hours in a day to spend developing a presence on any particular platform. I’m on CD Baby with a new album in place for purchase. Been on ReverbNation & per your review, Stan, & the commentaries following, it confirms my intuition that it’s more of an ego feed than an effective tool. As a writer promoting a book, learning to figure skate & wanting to spend time with my violin, grandchildren & dog, I don’t want to sit in front of a computer collecting fans that really don’t amount to anything. Some of the connections are nice, but this takes a lot of time and time is too precious to be pushing buttons to keep RN stats up, fan collection, etc. Same for other sites. Quality not quantity of sites is preferred, and I’d like THE BEST ONE & focus time/money on that one. Sounds like CD Baby is a good choice? Ask 10 musicians what the “best” site is and you could get 10 different answers. As you’ve seen, I’ve have reviews of CD Baby, Bandcamp, etc. here plus dozens of comments from other artists. You should also check out some other sites that do similar reviews or forums where people share experiences. I’m glad that you want to have all these varied experiences and outlets. That is excellent. Best wishes with all of it! I find SoundCloud useful for posting demos or works in progress to gauge feedback – sometimes to test sound quality, mix etc. However, I am becoming a little disillusioned as I feel it has become a bit directionless. Often you get likes from people who clearly just want you to like them back. I use the service both as a fan and musician. There is some really good quality indy music on there but I don’t think it does a good job in terms of driving people to buy music. So for the time being it’s fairly low on my list of priorities. I notice many users who use the site as a kind of free radio station, they don’t post music themselves. Maybe that’s a wrong assumption. But I actually find myself doing it too, listening to a few tracks, enjoying them but not taking it any further. Thanks for this. Well said and I agree with you on all counts. Exactly: if I’d ever “caught” anything on Soundcloud, I’d have spent more time there. Since my last comment I have learned a little more about SC, as I am fairly new to the current format. SC does work well for indie musicians, especially collaborations – which I am now mainly using it for. It’s not really a fan site, non-musicians will not use the platform (or rarely do, I think that’s probably the case). Of course all musicians are music fans so we can enjoy other musicians music. However, there are also a lot of scammers and spammers on there. Accounts you might think are fans are actually fake accounts – many of the ‘likes’ I get are from bogus accounts. It seems to be getting worse and I don’t see any efforts from the proprietors to deal with it. To reach (non-musician) music fans you really need to target Spotify, Apple Music, CD Baby etc. Great that you’re finding what works for you! P.S. The only place I’ve listened to your music is on BandCamp. Yes (on the comments) and thanks, Paul! @muz4now Good question, Stan – I don't think I can answer it either.